The Shima Peninsula, Mie Prefecture, is famous for pearl- and oyster-farming places in Japan, in addition to scenic spots formed by the ria shoreline. The peninsula is geotectonically divided into the Sambagawa, the Chichibu Composite (further subdivided into the Northern Chichibu, Middle Chichibu (or Kurosegawa), and Southern Chichibu belts) and the Shimanto belts from the north. Radiolarian fossils from the Southern Chichibu and Shimanto belts, and U–Pb ages of detrital zircon from the Sambagawa and Northern Chichibu belts were reported in this special issue. On a base map of the Seamless Digital Geological Map of Japan (1:200,000), the fossil and the zircon dating locations are indicated with blue, green and pink tacks. 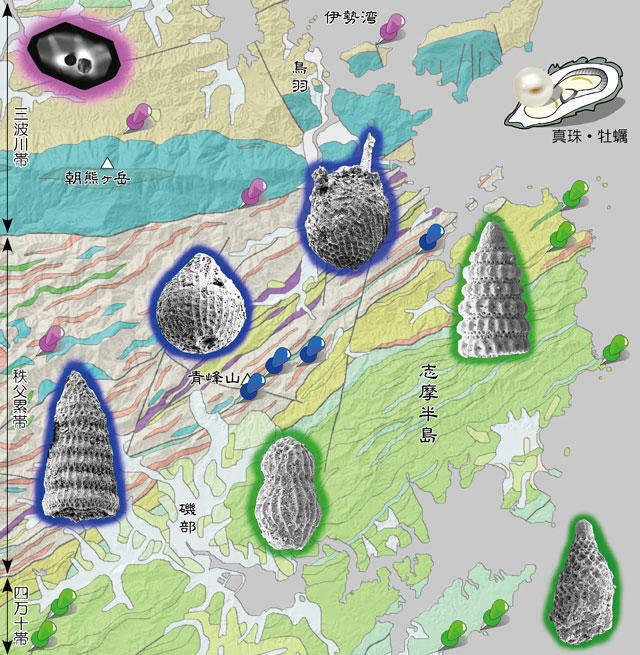 In addition, pictures of the typical radiolarian fossil species and zircon were collaged to the map. The radiolarian fossil species (background color: blue) from the Southern Chichibu Belt are Kilinora spilalis, Striatojaponocapsa conexa sensu Hatakeda et al. (2007) and Loopus primitivus, and those (background color: green) from the Shimanto Belt are Pseudodictyomitra tiara, Theocampe salillum and Amphipyndax tylotus in descending order. The Tsuiji Group (Middle to Late Jurassic accretionary complex) and the Imaura Group (Middle Jurassic to Early Cretaceous shallow-marine deposit) are distributed in the Southern Chichibu Belt, Shima Peninsula, Mie Prefecture. During a geological survey on the Toba District (Quadrangle series 1:50,000), we discovered Middle and Late Jurassic radiolarian fossils from mudstone of both groups and decided depositional ages in detail based on many radiolarian fossil species. A mudstone sample from the Tsuiji Group indicates early to middle Callovian, and mudstone samples from the Imaura Group are concentrated in three age groups: middle Bathonian to late Callovian, late Callovian to middle Oxfordian, and early Tithonian. The ages fall within the ranges of those that previous works reported. U-Pb ages of detrital zircon grains from sandstones of the Northern Chichibu Belt and psammitic schists of the Sambagawa Belt in the Toba District (Quadrangle series 1:50,000), Shima Peninsula, Mie Prefecture, Southwest Japan. The Geological Survey of Japan is now making a geological map and its explanatory text of geology of the Toba District (Quadrangle series 1:50,000), Shima Peninsula, Mie Prefecture. During its study, detrital zircon U–Pb ages from sandstone in the Northern Chichibu Belt and from psammitic schist in the Sambagawa Belt were measured in order to reveal accretion ages of the accretionary complexes in the both belts. The peak ages of the youngest clusters of the detrital zircon grains from the Osakatoge Complex and the Kochi Complex in the Northern Chichibu Belt are 204.4 ± 4.0 Ma and 183.4 ± 2.9 Ma, respectively. These ages are consistent to the depositional ages (Early and Middle Jurassic) of terrigenous deposits assumed from radiolarian fossils by a previous work. The peak ages of the youngest clusters of the detrital zircon grains from two samples in the Miyakawa Formation in the Sambagawa Belt are 177.1 ± 1.6 Ma and 95.5 ± 2.5 Ma. The latter is acceptable according to 99–83 Ma phengite K–Ar ages (metamorphic or cooling age on a subduction zone) from psammitic schist shown by a previous work in the Ise District (west of the Toba District). On the other hand, the former is much older than the latter although the both samples may belong to a same unit. Therefore, more data such as phengite K–Ar ages or additional detrital zircon U–Pb ages are necessary to verify the scientific validity of the former (Early Jurassic age). A detailed field mapping and radiolarian dating in the Toba District, the Shima Peninsula (eastern tip of the Kii Peninsula) have revealed Coniacian–Campanian mudstones of the Upper Cretaceous Matoya Group. This group belongs to the Shimanto belt (northern subbelt) that formed along the plate boundary where the Kula plate has been subducting beneath the paleo-Asian continent. Seven out of 51 radiolarian-bearing samples from different outcrops of mudstone yield relatively well-preserved radiolarian assemblages, which are concentrated in three age-groups: (i) Early Coniacian, (ii) Early Campanian or Middle Santonian–Middle Campanian, and (iii) Middle–Late Campanian. This evidence has a potential to chronologically and stratigraphically divide the Matoya Group into several units.